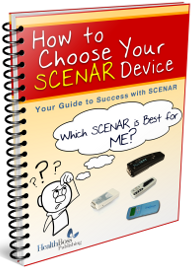 SCENAR Can Be Miraculous – and yet, If You Get a Wrong Device, Your Investment Can Be at Stake. You Do Not Want Your Star Trek Healing Device Collect Dust on the Shelf, Do You? Enter your name and email below for instant access to the report now. Confused about choosing a SCENAR device that is going to actually WORK FOR YOU? Lost in the abundance of options and can’t decide WHICH MODEL TO GO FOR? Concerned about investing in a device that MAY NOT BE even a SCENAR after all? ‘Insider Secrets’ to the convoluted SCENAR World and a roadmap to understanding the evolution and innate benefits of this groundbreaking technology. The keys to understanding the Dis-ease process in your body and how you can use SCENAR and COSMODIC to influence it with the maximum efficiency. How you can distinguish genuine SCENAR and COSMODIC devices from ‘wannabies’ and copycats. The truth about SCENAR: is this really a “magic bullet”?